Life on Earth - Solar System Planets And Moons Section. Mapping Life on Earth Could Predict Finding it on Mars. 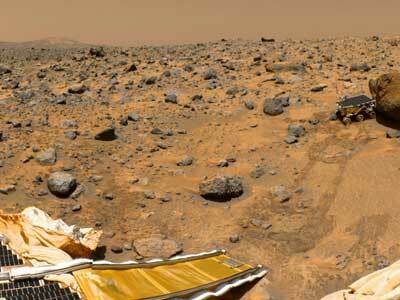 Pathfinder's image of Mars. Image credit: NASA/JPL. A researcher from Washington University in St. Louis is developing techniques that will help understand how early life developed and diverged here on Earth, to help predict where and what form it might take on Mars. Carrine Blank has traced the genetic relationships between different classes of bacteria, and determined when they broke away from each other to evolve into distinct organisms. These patterns of divergence have happened in several places on Earth, so it's possible they happened on Mars too. A geologist from Washington University in St. Louis is developing new techniques to render a more coherent story of how primitive life arose and diverged on Earth - with implications for Mars. Carrine Blank, Ph.D., Washington University assistant professor of Earth and planetary sciences in Arts & Sciences, has some insight concerning terrestrial microbes that could lead to provocative conclusions about the nature of Life on Mars and other planets. Carinne Blank (below) has a method she uses to date ancient life forms that could be helpful for specimens from Mars. Blank approaches the task by resolving phylogenetic trees. These trees, based upon genetic sequencing data, trace the genetic relationships between what we think of as primitive organisms through trait development. The relationships between early forms of life can illuminate the relationships between organisms present on Earth today - which fossil evidence and a method called isotopic fractionation have failed to show conclusively. Blank most recently presented her research at the 2004 annual meeting of the Geological Society of America. Microorganisms can be divided into haves and have-nots: cells of eukaryotes contain a nucleus, while prokaryotic organisms cells do not. Prokaryotic organisms encompass archeal and bacterial domains of life. Archeal organisms diverge further into euryarcheota and Crenarcheota lineages. By piecing together genetic sequences of the three types of prokaryotic organisms, Blank creates a genetic flow chart, which can be interpreted to trace the appearance of environmental adaptations across billions of years of evolution. Genes are inherited from parents, but can transfer from one organism to another without reproducing by a process called lateral gene transfer. Modular metabolic genes, which are not critical for cell production, account for most lateral gene transfers between microbes. "There is a lot we're beginning to understand in terms of bacterial evolution that is still not quite clear," Blank said. "What we're trying to resolve is the evolutionary history of the core of the bacterial cell. The core is that which is not undergoing this lateral gene transfer, or does it extremely rarely." Jumping genes may be a headache for researchers, but they serve an important ecological purpose, helping other organisms to succeed in their habitats, and can illuminate trait development across the tree of life. "We try to construct the core with gene sequences, and then we look at the distribution of traits such as those involved in metabolism by laying it onto the tree," she said. Timely appearances of certain traits among prokaryotes on the tree of life can betray a trend of habitat divergence, facilitated by lateral gene transfer. The emergence of traits corresponding to measurable changes in the known geologic record allow researchers to date organisms with relative certainty. Blank can then use chronological data to analyze niche specialization, "where these organisms like to grow," among members of each life domain over geologic time. Habitat divergence among bacteria is consistent with patterns of divergence among the other prokaryotes, Blank's research shows. She notes a pervasive trend of cyanobacterial organisms diverging from low-salinity environments into marine environments over time. "We have the ancestral Archeae - it diverges into two major lineages, the Crenarchaeota and the Euryarchaeota, one which grows in marine environments, the other on continents," Blank said. "They grow and diverge for perhaps a billion years, and then they start colonizing each other's environments. The marine Euryarchaeota eventually colonize the terrestrial environments and the Crenarchaeota colonize the marine environments. My point is that it could have taken a very long time for them to come back and to form even more complex ecosystems. So the literal interpretation of these patterns is that early habitat specialization could have lasted for a billion years." After mapping early habitat divergences onto the tree, Blank observes that the ancestors of each of the three kinds of prokaryotes inhabited one of Earth's three types of hydrothermal systems, which include sulfurous steam vents like those which smatter the Yellowstone caldera, hydrothermal deep-sea vents, and boiling silica-depositing springs. "Is it a coincidence, then, that we have three hydrothermal habitats and three major groups of prokaryotes? We aren't sure," she said. "This could suggest that we have some really ancient habitat specialization. These lineages specialize in these three habitats, and diverge in these habitats for many hundreds of million years before they start moving into other types of habitats." It isn't clear why bacteria diversified later, though environmental changes, like periods of global glaciation nicknamed "snowball Earth," could have provided the impetus that demanded microbial adaptation. Whatever the cause, new adaptive microbial traits can be very different from those of their "peculiar" ancestors. It seems that, on some level, humans and bacteria can relate. "If we see these major patterns of divergence on Earth, we should expect to see similar patterns on life on Mars, that is, if life ever existed there," Blank said. "Not the same patterns, because Mars has had a different history, but we should see trends that are analogous. You would expect to see a peculiar ancestor specialized to a unique niche, eventually diverging into descendants that have very different traits than their ancestor did. These descendents would have adapted to changes that would've happened in Mars's history."